IT HAS BEEN USED AS INTENDED AND HAS SOME DISCOLORATION INSIDE BOTTOM THAT IS NOT DETRIMENTAL TO USE OR TO APPEARANCE – THAT’S IT! BEAUTIFUL VASE AND A BEAUTIFUL ADDITION TO A COLLECTION! THIS VASE IS COMMONLY REFERRED TO AS THE “SHORTER” DOUBLE TULIP VASE. IT MEASURES 6 ½” TALL (AT TALLEST POINT), 3 ¼” WIDE (AT WIDEST), 7 ¾” LONG (AT LONGEST) AND BOTTOM IS MARKED MCCOY, USA. IT IS IN EXCELLENT CONDITION – NO CHIPS, NO DINGS, NO CRACKS – HAS VERY MINOR GLAZE CRAZING THAT IS NOT UNCOMMON ON ITEMS WITH CLEAR OVER-GLAZE. THIS VASE IS A BEAUTIFUL ADDITION TO ANY COLLECTION! WOW – ABSOLUTELY BEAUTIFUL McCOY MUMS VASE! THIS IS THE “PURPLE” MUMS VASE THAT IS ACTUALLY MORE LILAC COLOR AND WHITE. IT MEASURES 8” TALL, BOTTOM IS MARKED McCOY, AND IT IS IN EXCEPTIONAL CONDITION – LOOKS NEW AND UNUSED! THIS LISTING HAS AN EXCELLENT CONDITION McCOY YELLOW MUMS VASE! IT MEASURES 8” TALL AND BOTTOM IS MARKED McCOY. VASE HAS A PRODUCTION FIRED-ON POTTERY FLAKE INSIDE – OF NO CONSEQUENCE AND ABSOLUTELY NOT DETRIMENTAL – THE VASE HAS BEEN EXTREMELY PAMPERED, IT LOOKS NEW AND UNUSED! BEAUTIFUL MINT CONDITION MCCOY SINGLE LILY VASE! MEASURES 8” TALL (AT TALLEST), BOTTOM IS MARKED MCCOY, AND IT’S MATTE WHITE COLOR. THIS VASE APPEARS TO HAVE NEVER BEEN USED AND WAS ALWAYS PAMPERED. IT HAS A MCCOY PRODUCTION RUB ON ONE LEAF – IT IS PRODUCTION AND IS NOT DETRIMENTAL IN ANY WAY (REALLY NOT EVEN WORTH MENTIONING!). SUPER ADDITION TO A COLLECTION! ABSOLUTELY BEAUTIFUL, ABSOLUTELY MINT CONDITION MCCOY YELLOW CHRYSANTHEMUM VASE! THIS VASE HAS LED A VERY PAMPERED LIFE – IT LOOKS NEW! MEASURES 8” TALL (AT TALLEST) AND BOTTOM IS MARKED MCCOY. THIS VASE IS A TREASURE FOR ANY COLLECTION! THE COLORS ON THIS MCCOY DOUBLE TULIP VASE ARE SOMEWHAT UNUSUAL! THE TIPS ARE A VERY PRETTY DARK PINK/MAUVE COLOR AND THE COLOR IS MOSTLY ON THE TIPS! 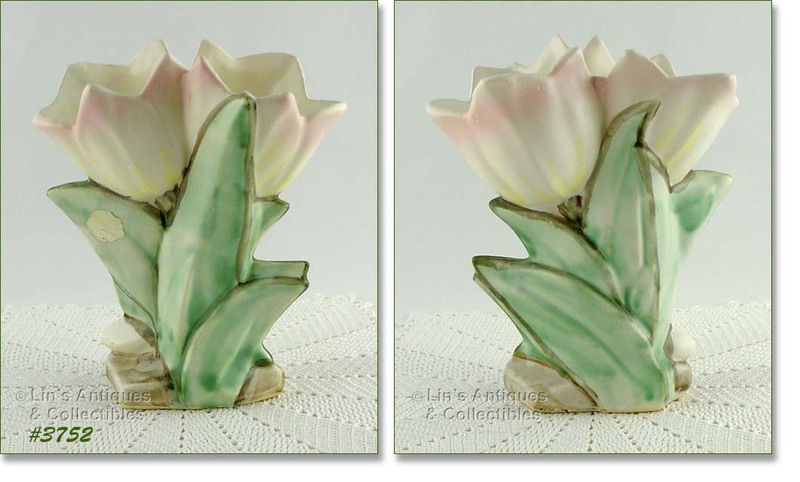 THE LEAVES ARE A DARK GREEN COLOR AND VASE HAS A SHINY OVER-GLAZE ON ONE SIDE AND THE OTHER SIDE HAS A SEMI-MATTE FINISH (MOST NOTICEABLE ON THE TULIP FLOWERS). VERY UNUSUAL AND IT IS PRODUCTION. THERE ARE NO CHIPS, DINGS, OR CRACKS BUT VASE HAS LIGHT CRAZING (ON THE TULIPS ON THE SIDE WITH CLEAR OVER-GLAZE). NEAT ITEM, DEFINITELY UNUSUAL! 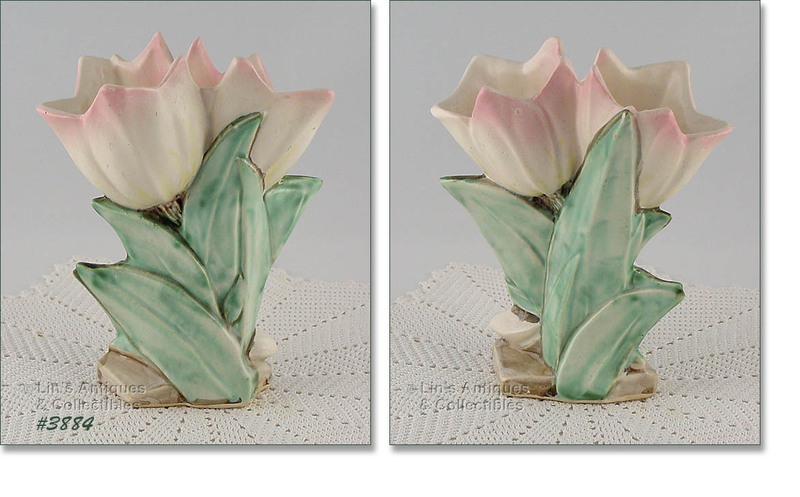 THIS LISTING HAS A MCCOY DOUBLE TULIP VASE WITH PASTEL PINK TIPS! VASE MEASURES 8” TALL (AT TALLEST), BOTTOM IS MARKED: MCCOY, MADE IN USA, AND IT’S IN SUPER CONDITION. THERE ARE NO CHIPS, DINGS, ETC – NO EVIDENCE OF “USE”. IT HAS A COUPLE PRODUCTION PIN-POPS THAT ARE OF NO CONSEQUENCE. LOVELY VASE! 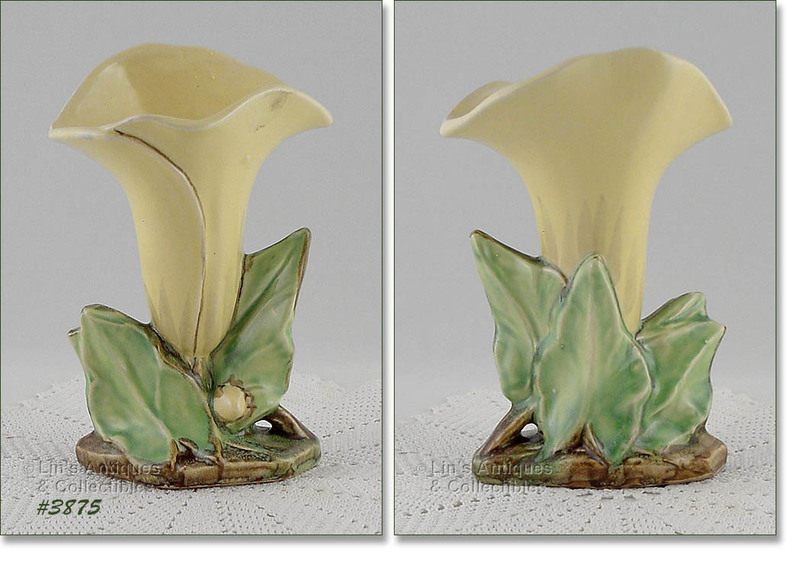 THIS LISTING HAS A VERY PRETTY MCCOY SINGLE LILY VASE! 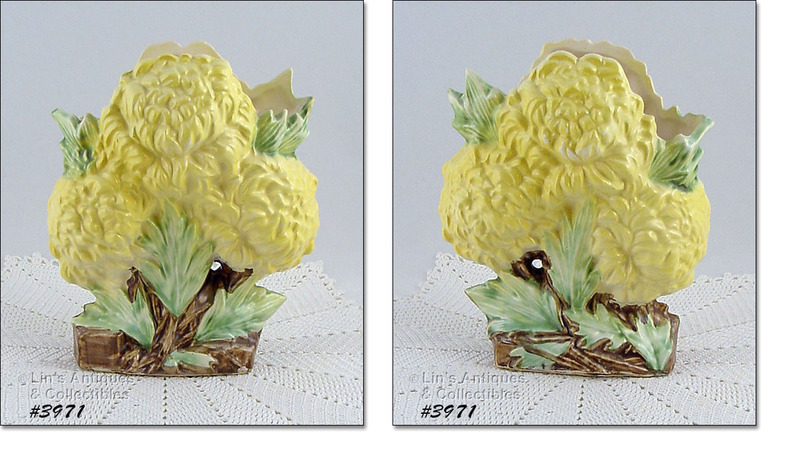 IT’S PALE YELLOW COLOR WITH SEMI-MATTE OVER-GLAZE AND IS IN EXCELLENT CONDITION. VASE HAS NO EVIDENCE OF “USE” BUT DOES HAVE A PRODUCTION MCFLAW – A SMALL DISCOLORATION ON FRONT, SEE PHOTO. THIS IS NOT A REPAIR OR DAMAGE, JUST DISCOLORATION THAT OCCURRED DURING PRODUCTION. VASE IS MARKED MCCOY. LOVELY ITEM, PRICED TO REFLECT MCFLAW! 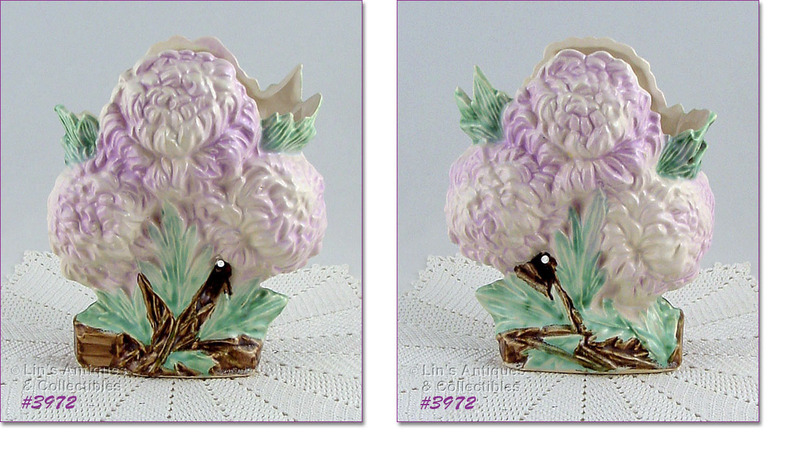 THIS LISTING HAS A PURPLE MUMS VASE PRODUCED BY MCCOY IN 1950! ALTHOUGH COMMONLY REFERRED TO AS “PURPLE” MUMS, THE COLOR ON THIS ONE IS ACTUALLY MORE LILAC COLOR – VERY PRETTY! VASE IS MARKED MCCOY AND IS IN WONDERFUL CONDITION – THE ONLY IMPERFECTIONS I COULD FIND WERE 3 TINY 1/8” DINGS ON THE FLOWERS – VERY TINY AND NOT DETRACTING IN ANY WAY – THIS IS A SUPER ITEM! 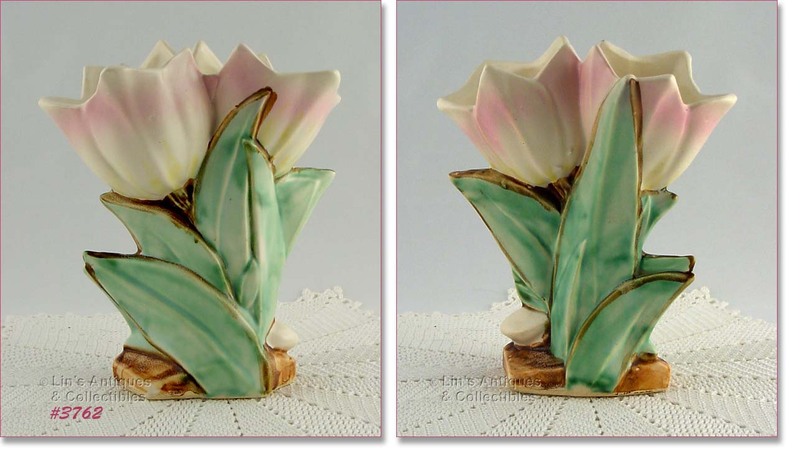 THIS LISTING HAS A SINGLE LILY VASE PRODUCED BY MCCOY IN 1947! VASE IS MARKED MCCOY AND IS IN SUPER CONDITION. IT HAS NO CHIPS, DINGS, OR CRACKS BUT HAS SOME PRODUCTION NON-COLOR/NON-GLAZE “RUBS” ON SOME OF THE LEAVES. THIS IS A TYPICAL PRODUCTION MCFLAW, NOT UNUSUAL AND NOT DETRIMENTAL. LOVELY VASE! BEAUTIFUL MCCOY DOUBLE TULIP VASE WITH PALE PINK TIPS! PRODUCED IN 1950, VASE IS IN SUPER CONDITION WITH NO CHIPS, DINGS, OR CRACKS. ONE TULIP HAS A COUPLE FIRED-ON SMALL POTTERY FLAKES – IT IS A TYPICAL PRODUCTION MCFLAW AND NOT DETRIMENTAL. BOTTOM IS MARKED MCCOY. VASE WOULD BE AN EXCELLENT TO A COLLECTION – IT’S LOVELY! THE COLORS ON THIS MCCOY DOUBLE TULIP VASE ARE SO PRETTY! THE VASE HAS A MATTE FINISH (NOT SHINY), THE TULIPS ARE WHITE WITH VERY PALE PINK TIPS, AND THE LEAVES ARE SEA-FOAM GREEN. BOTTOM IS MARKED MCCOY AND THE VASE IS IN EXCELLENT CONDITION. THE ONLY POSSIBLE FLAW I COULD FIND IS A VERY FAINT ½” LINE ON THE BACK LOWER PART OF A TULIP. IT APPEARS TO BE A HAIRLINE BUT THAT IS NOT POSSIBLE DUE TO ITS LOCATION. THE LINE DOESN’T GO THROUGH AND DOESN’T EXTEND PAST ITS ½” LENGTH. I BELIEVE IT IS PRODUCTION BECAUSE THIS VASE HAS NOT BEEN USED/ABUSED – IT STILL HAS THE ORIGINAL MCCOY SILVER FOIL STICKER/LABEL ON FRONT! THIS IS A BEAUTIFUL VASE AND WOULD BE AN EXCELLENT ADDITION TO A COLLECTION. ABSOLUTELY BEAUTIFUL MCCOY SINGLE LILY VASE! PRODUCED IN 1947, VASE IS MATTE YELLOW COLOR, MEASURES 8” TALL (AT TALLEST), AND BOTTOM IS MARKED MCCOY. VASE IS IN EXCELLENT CONDITION AND THE COLORS ARE EXCEPTIONAL – A TREASURE FOR ANY COLLECTION! WOW – WHAT A PRETTY MCCOY ITEM – THIS IS A TRIPLE BULB PLANTER! THE COLORS ARE GORGEOUS AND PLANTER IS IN EXCELLENT CONDITION – NO CHIPS, NO CRACKS, NO CRAZING. IT HAS A PRODUCTION NON-GLAZE/COLOR ON ONE TIP – THAT’S IT!! BOTTOM IS MARKED MCCOY, USA. SUPER ITEM THAT HAS OBVIOUSLY ALWAYS BEEN PAMPERED – THERE IS NO EVIDENCE THAT IT HAS EVER HELD A PLANT! 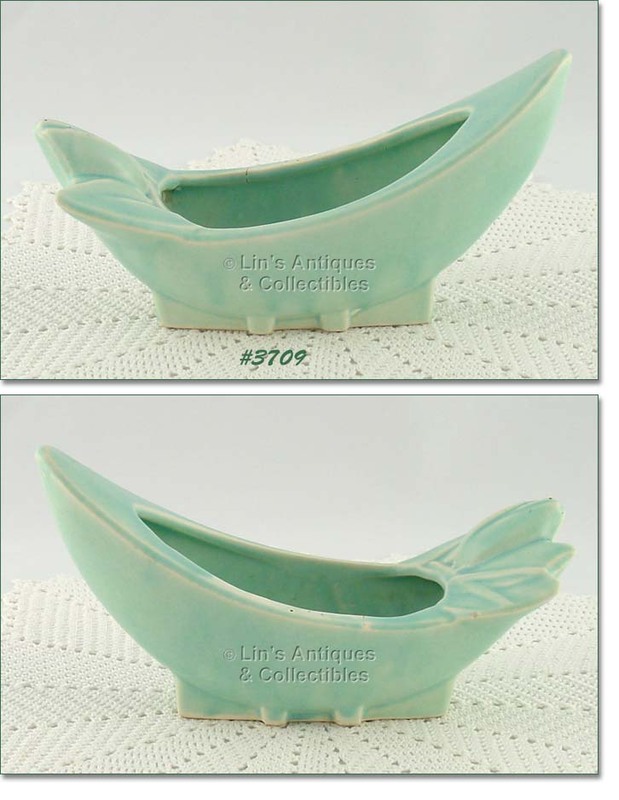 THIS LISTING HAS A MCCOY BOAT SHAPED FLOWER DISH FROM THE LILY BUD LINE OF THE EARLY 1940’S! MEASURES 8 ¾” LONG (AT LONGEST), 5” TALL (AT TALLEST), AND IS A PRETTY MATTE AQUA COLOR. BOTTOM IS MARKED WITH OVERLAPPING NM, USA. IT’S IN VERY GOOD CONDITION – HAS A ¼” PRODUCTION STRESS AT RIM AND SOME TYPICAL PRODUCTION PIN-POPS. THE ONLY “USE” EVIDENCE IS A COUPLE OF RUST SPOTS INSIDE AND A TINY 1/8” DING ON EDGE OF A LEAF. SUPER ITEM – SUPER ADDITION TO A COLLECTION! BEAUTIFUL MCCOY TULIP VASE WITH MAUVE TIPS! BOTTOM IS MARKED MCCOY AND VASE IS IN SUPER CONDITION. IT HAS TYPICAL MCCOY COLOR/GLAZE IMPERFECTIONS (SEE PHOTOS), THERE IS A BARELY VISIBLE STRESS ON AN END RIM EDGE (HAS CLEAR OVER-GLAZE), AND THERE’S A PRODUCTION SLICE TYPE POTTERY FLAKE-OFF ON ONE INSIDE TIP (IT HAS CLEAR OVER-GLAZE) – ALL ARE PRODUCTION. THE ONLY “USE” EVIDENCE IS A 1/8” DING AT THE RIM EDGE BY THE FLAKE-OFF – THAT’S IT! I WOULD NOT CONSIDER IT DETRIMENTAL BUT IT’S THERE AND I HAVE PRICED THE VASE TO REFLECT ITS BEING A LITTLE LESS THAN PERFECT. EXCELLENT CONDITION MCCOY FLOWER FORM VASE! THIS IS THE CHRYSANTHEMUM VASE AND IT HAS BEAUTIFUL COLOR – PLEASE SEE PHOTOS. BOTTOM IS MARKED MCCOY, VASE IS 8” TALL, AND HAS ABSOLUTELY NO EVIDENCE OF “USE”. SUPER ADDITION TO ANY COLLECTION! VERY PRETTY MCCOY FLOWER FORM FLOWERPOT! IT’S GRAY WITH GREEN ATTACHED DRIP SAUCER – THE GRAY POT IS SHAPED LIKE A TULIP BLOOM AND THE SAUCER IS THE “LEAVES”. 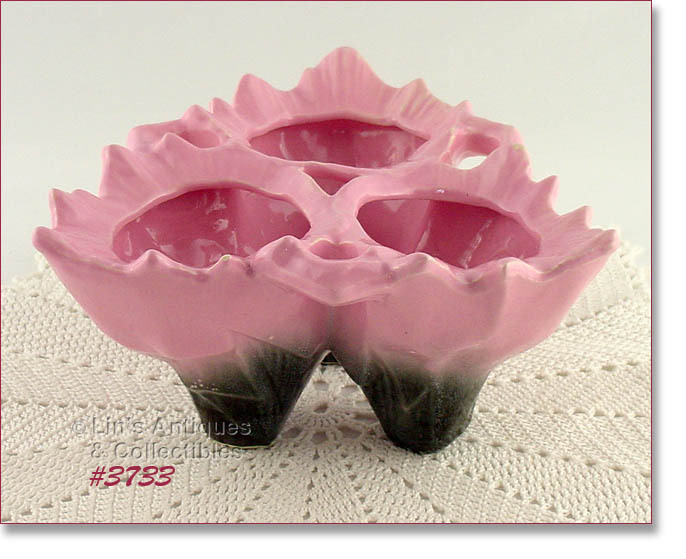 FLOWER POT IS IN VERY GOOD CONDITION – HAS A 1” INTERIOR PRODUCTION STRESS, SAUCER HAS A ½” PRODUCTION STRESS. THE STRESS IN THE POT SHOWS ON THE OUTSIDE AS A CRAZE – I DO NOT BELIEVE IT TO BE A HAIRLINE BECAUSE IT SOUNDS “TRUE” AND THE CRAZE IS BARELY VISIBLE! HOWEVER, FLOWER POT IS NOT PERFECT AND HAS BEEN PRICED ACCORDINGLY – DO NOT BE DETERRED, THIS IS A LOVELY ITEM FOR USE OR TO ADD TO A COLLECTION! THIS MCCOY VASE IS IN EXCELLENT CONDITION AND IS FROM MY COLLECTION. 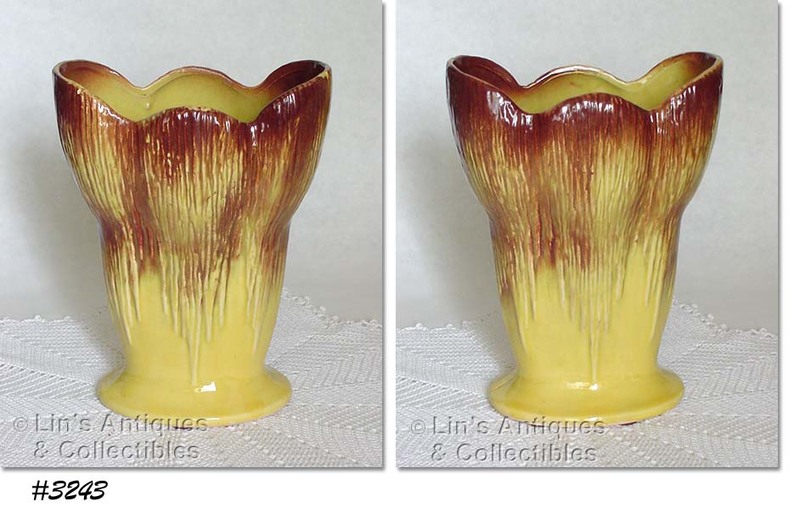 IT’S A PRETTY YELLOW COLOR WITH BROWN/TAN COLOR ACCENTS, MEASURES 9” TALL, TOP OPENING IS 6 ½” LONG, 3 ½” WIDE, AND BOTTOM IS MARKED MCCOY, USA. DIFFICULT TO BELIEVE IT WAS MADE IN 1953 – IT HAS NO CHIPS, CRACKS, OR DINGS. VASE HAS VERY MINOR CRAZING AND I PLACED BROWN FELT DOTS ON THE BOTTOM DRY RING TO PREVENT SCRATCHES ON OUR MARBLE TOP TABLES – THE DOTS ARE EASILY REMOVED. 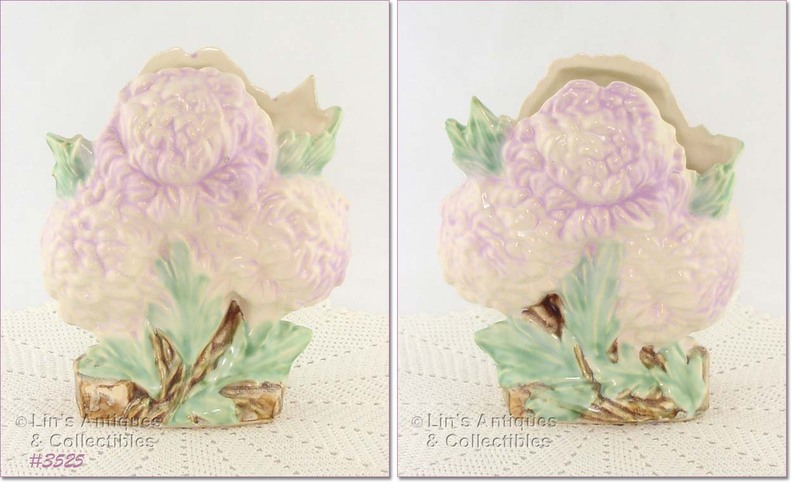 LOVELY MCCOY FLOWERPOT IN THIS LISTING! THE POT IS SHAPED LIKE A LARGE YELLOW TULIP BLOOM WITH ATTACHED DRIP SAUCER OF BROWN “LEAVES”. FLOWERPOT IS MARKED MCOY, USA (THE MOLD FOR THIS SHAPE FLOWERPOT HAS MCCOY SPELLED INCORRECTLY). IT’S IN WONDERFUL CONDITION – HAS BEEN USED AS INTENDED AND HAS SOME MINERAL DEPOSITS/RESIDUE IN SAUCER BOTTOM. THE POT HAS PRETTY CRAZING THAT HAS SLIGHTLY DARKENED INSIDE – THAT’S IT! VERY PRETTY. 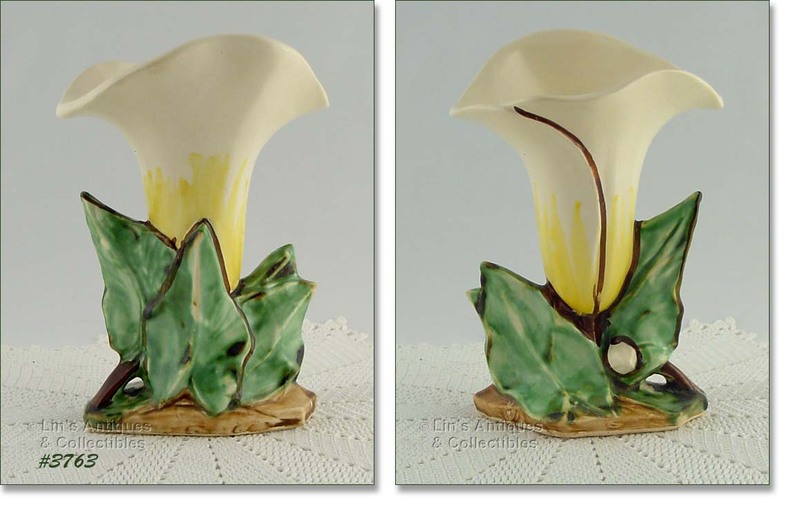 MCCOY’S FLOWER FORM VASES ARE SO PRETTY – THIS LISTING HAS A TRIPLE CALLA LILY VASE! LILIES ARE A SOFT WHITE COLOR AND THE LEAVES ARE LOVELY SHADES OF GREEN. MARKED MCCOY, USA, AND IS IN EXCELLENT CONDITION WITH NO CHIPS OR CRACKS BUT DOES HAVE THE TYPICAL LIGHT CRAZING THAT IS VERY COMMON ON THIS COLOR WITH SHINY GLAZE. VERY NICE VASE! ANOTHER BEAUTIFUL AND EXCELLENT CONDITION MCCOY VASE! 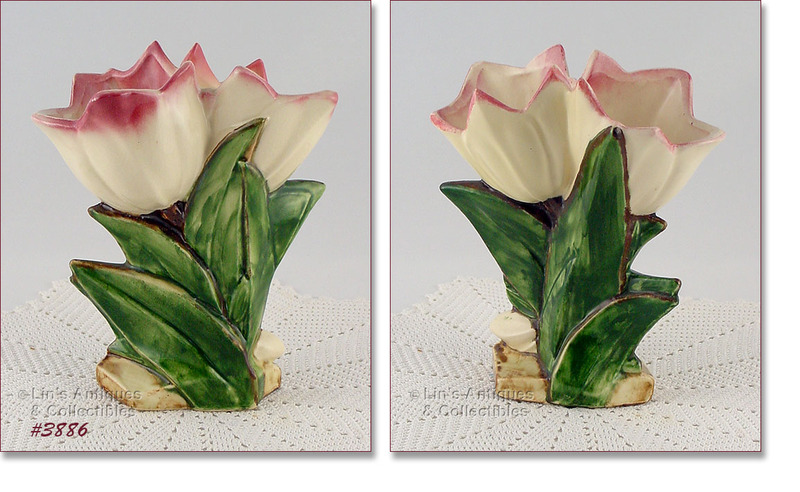 THIS IS THE DOUBLE TULIP VASE IN YELLOW AND THE LEAVES ARE ALMOST A LIME COLOR. MARKED ON BOTTOM: MCCOY. VASE HAS ABSOLUTELY NO EVIDENCE OF “USE” – THERE IS A ¼” HORIZONTAL NON-COLOR/GLAZE ON A FLOWER – PRODUCTION AND NOT DETRIMENTAL IN ANY WAY. SUPER ADDITION TO ANY COLLECTION! 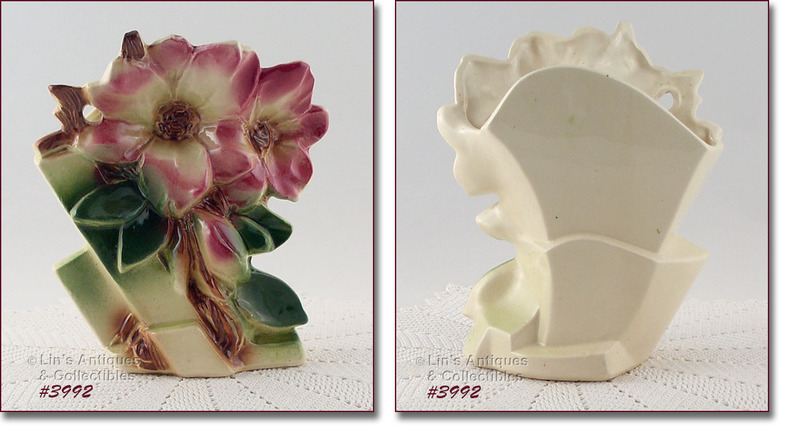 MCCOY’S BEAUTIFUL LILY BOOKENDS ARE SELDOM FOUND ON THE MARKET AND SELDOM IN THIS EXCELLENT CONDITION! THESE ARE FROM MY COLLECTION – THEY HAVE NO CHIPS OR CRACKS AND HAVE BEEN DISPLAY ONLY. ONE HAS A 1” PRODUCTION STRESS AT THE MOLD LINE IN BACK – IT’S PRODUCTION AND NOT DETRIMENTAL – THAT’S IT!